Dozens of youth and young adults from the tri-county Archdiocese of Los Angeles have embarked on a once-in-a-lifetime pilgrimage, traveling to Panama, with a quarter of a million Catholics and the Holy Father Pope Francis to celebrate World Youth Day (WYD) 2019, through January 27. Since Pope John Paul II launched WYD 35 years ago, it’s become not just the Catholic Church’s biggest event, but also the world’s largest gathering of young people. WYD is a transformative pilgrimage experience, targeting those ages 16 to 35, offering youth and young adults the opportunity to deepen their faith as they celebrate their Catholic identity with peers from around the world. The culminating World Youth Day events will be time spent with Pope Francis at an evening prayer vigil tomorrow night and the closing Mass the next morning at the St. John Paul II field. In between, Los Angeles pilgrims will be among the thousands of pilgrims sleeping under the stars at the same field. Bishop David O’Connell, Auxiliary Bishop for the San Gabriel Pastoral Region is leading 35 young people in pilgrimage to Panama. Bishop Robert Barron, Auxiliary Bishop for the Santa Barbara Pastoral Region and Ernesto Vega, Coordinator of Adult Faith Formation for the Archdiocese of Los Angeles are among this year’s World Youth Day speakers. The patron saints for this year’s edition include St. John Paul II, St. Oscar Romero, the Mexican child martyr Jose Sanchez del Rio; Peruvian St. Rosa of Lima; St. Juan Diego and Peruvian St. Martin de Porres. Though participation is usually led by Italy, this time the second-largest number comes from the United States, followed by Costa Rica, Brazil, Mexico, Colombia, El Salvador, Guatemala and Poland. For more information visit http://worldyouthday.com/panama-2019. 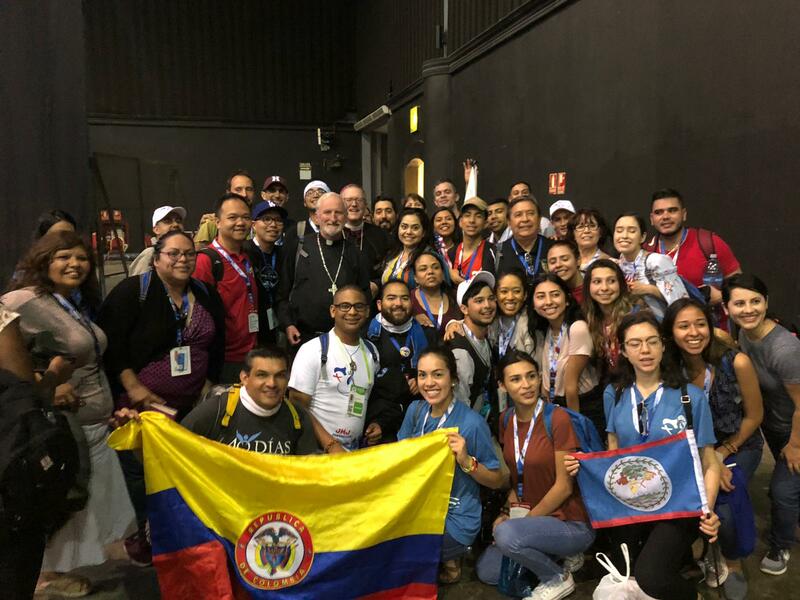 PHOTO CAPTION: Bishop David O’Connell, Auxiliary Bishop for the San Gabriel Pastoral Region and Bishop Robert Barron, Auxiliary Bishop for the Santa Barbara Pastoral Region with World Youth Day pilgrims in Panama City, Panama.